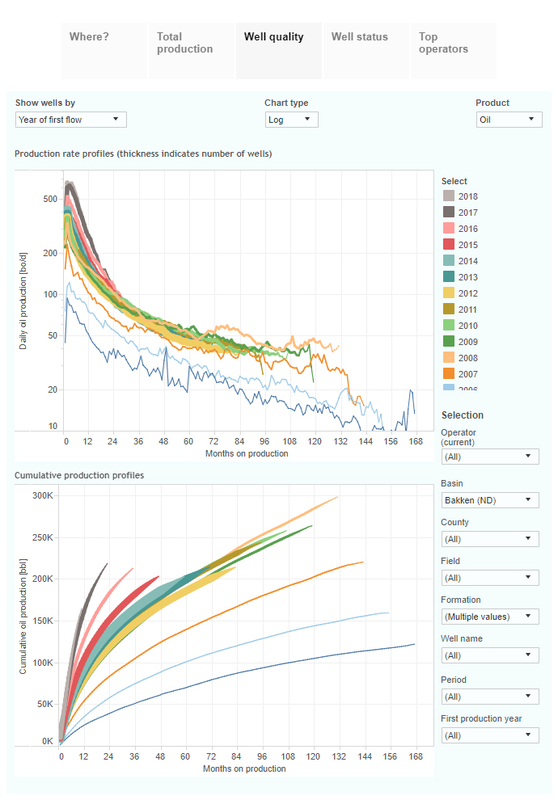 These interactive presentations contain the latest oil & gas production data from all 14,263 horizontal wells in North Dakota that started production since 2005, through November. Oil production in North Dakota dropped 1% m-o-m to 1,376 kbo/d in November, after a record output in October. 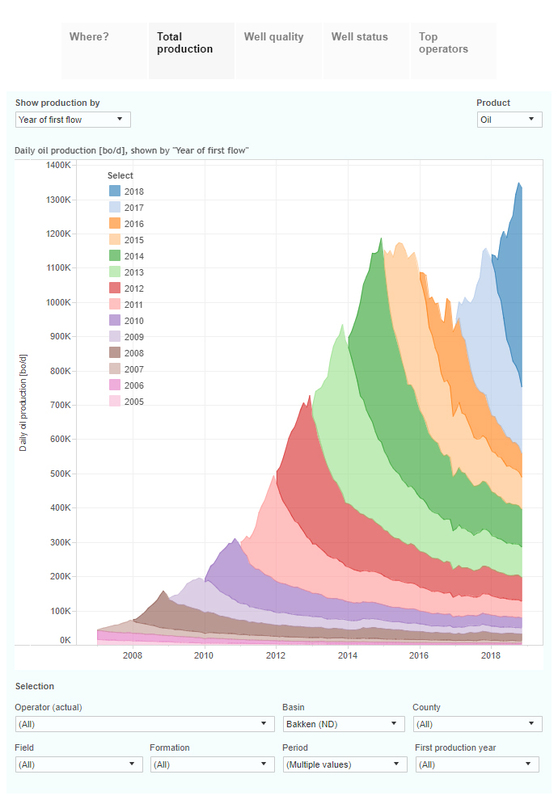 The main factor behind this drop appears to be the smaller number of wells that went into production in October (119) and November (108), after a busy summer (~140 completions per month). The 2nd tab (“Well quality”) shows that the wells that came online in 2018 perform slightly better on average than the ones from the year before. 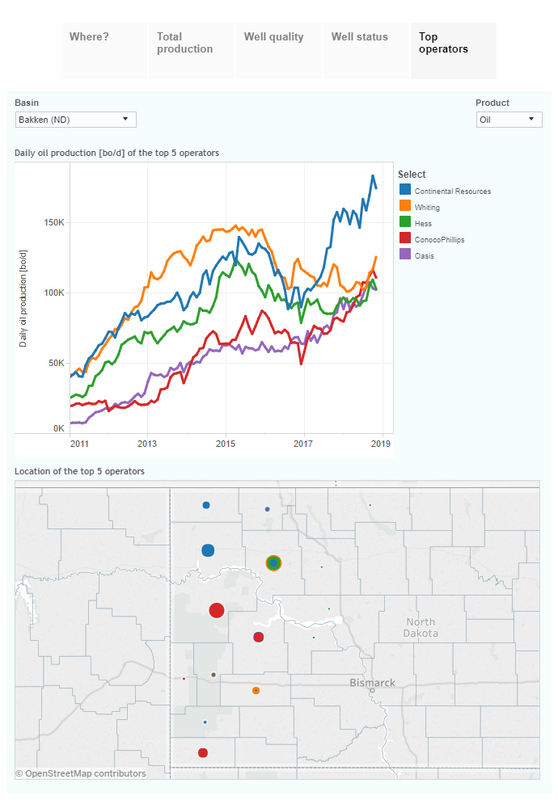 Each of the 5 largest operators produces over 100 thousand barrels of oil per day (gross) in this state (“Top operators”), and all of them increased output in 2018. Together they are responsible for over 40% of all oil produced in November. 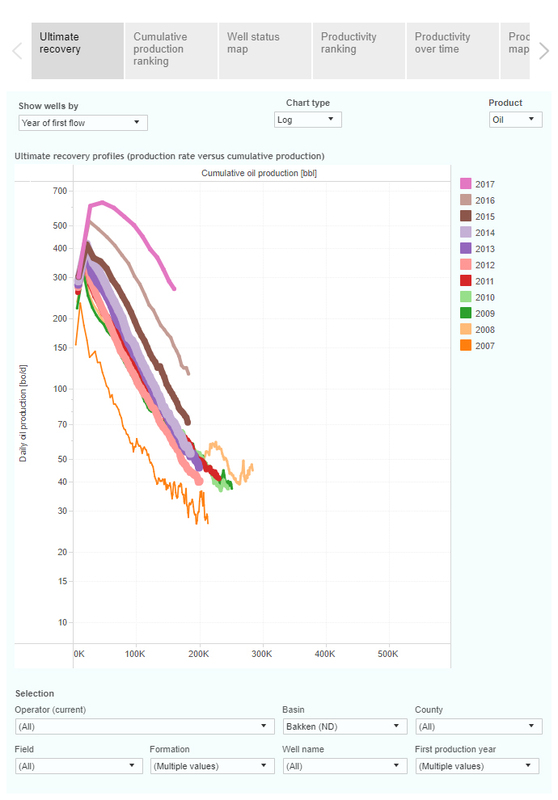 The graph shows clear improvements in initial well productivity over the last couple of years. Interesting is however also that wells from the 2008-2011 period decline slightly slower than those from 2012-2015. This effect remains even after correcting for refracs (which is possible in our advanced analytics service). 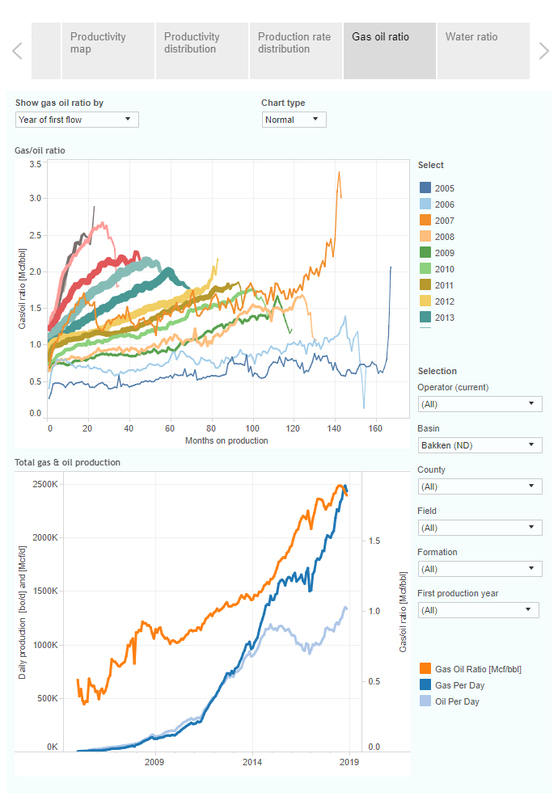 The gas/oil ratio (GOR) has steadily climbed in North Dakota, as is depicted by the orange curve in the bottom graph on the 9th tab (“Gas oil ratio”). The reasons behind that are revealed in the plot above it; the GOR normally climbs over the life of a well, but newer wells are also starting with a higher GOR, and see their GOR rising faster. In the coming days we’ll have a new update on gas production in Pennsylvania, on which we will also report in our chat tomorrow morning on enelyst (10:30 am EST).